The 2016 Rio Olympics have been plagued with difficulties since long before the games began, and between the green dive pool fiasco and the pathetic Olympic Village accommodations, things haven't exactly been going smoothly now that the game's underway. 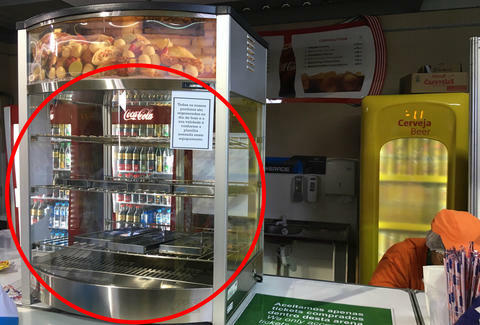 As if that wasn't bad enough, though, it turns out there's a serious food shortage at the Olympic venues, to the point where there's nothing for spectators to eat other than popcorn, chips, and ice cream. While that might sound like the ideal diet if you're, say, 10 years old, it's decidedly less fulfilling if you're a hungry tourist watching the 1500-meter Freestyle. Yeah, not the best. Thrillist's own Senior News Editor Ryan Craggs confirmed the shortage at the while on location in Rio, citing astonishingly long lines for popcorn at the Olympic Aquatics Stadium and a total lack of "real food." In his own words, "All the hot cases are emptier than a Brazilian politician's promises." All's not lost, however: enterprising food trucks have reportedly stepped up to fill the vacuum left by those woefully undersupplied Olympic vendors, according to a report by The Guardian. This should hopefully help alleviate the spectators' hunger pangs, at least until the official food situation is remedied. Or, until the Olympic games end -- whichever comes first.